May Good Things Grow this spring! Check out this month’s unboxing and get started with this one of a kind kit today! Paper Pumpkin’s March 2018 kit features vintage floral blossoms, and seed packet inspired envelopes. 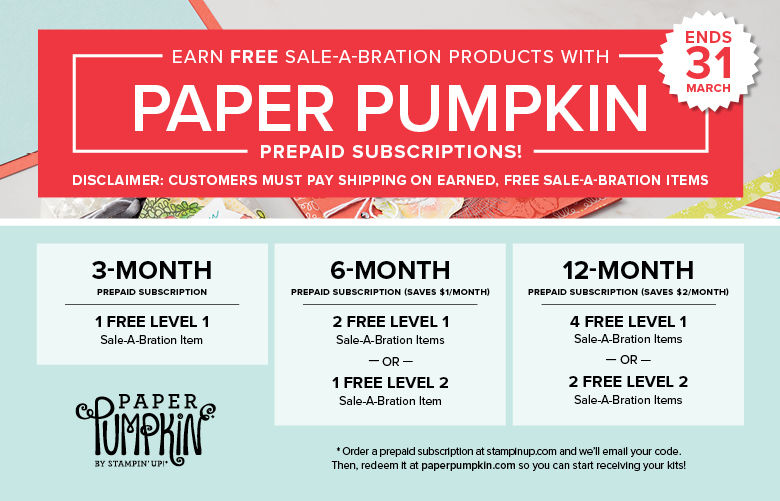 New Paper Pumpkin Subscribers get 50% Off! For those who are current or returning subscribers, you can still reap some rewards. In fact everyone that purchases a 3, 6 or 12 month pre-paid subscriptions by the end of March will get to choose FREE Sale-a-Bration products! I did not get mine yet … should be in my mailbox today!! When I do, you know that I will be sharing alternative projects with you! « Wow … 50% OFF first 2 months!